Officials say the $12 billion Daxing airport could one day serve more than 100 million passengers per year, approaching the traffic volumes of the busiest airport in the world, Hartsfield-Jackson International Airport in Atlanta. The new Beijing airport will have five concourses spiraling out of the primary hall. Before the Beijing Olympics in 2008, the Chinese capital unveiled a new airport terminal that covered about 200 football fields in floor space, boasted a capacity of 50 million passengers a year, and cost $4 billion. That's modest compared to what Beijing is opening next. Crews are putting the final touches on what will be one of the world's largest and busiest airports. 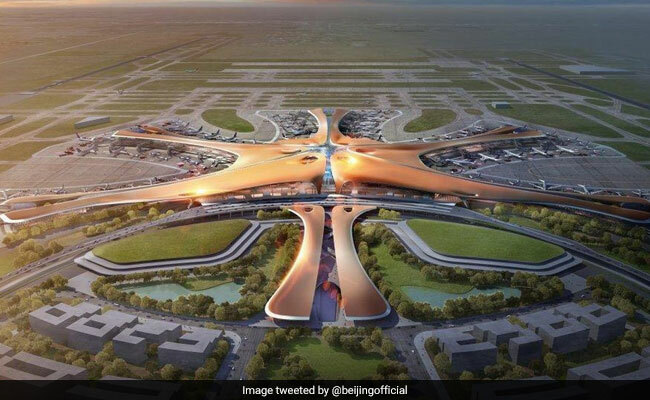 Designed by the late British architect Zaha Hadid, the phoenix-shaped Beijing Daxing International Airport is due to open in September as the latest major Chinese project even as the country's economy cools. Rising out of farmland about 30 miles south of central Beijing, the new transport hub is a testament to the growth in civil aviation in China - which is expected to overtake the United States as the largest market in the early- or mid-2020s - and the government's vision to develop its industrial north through infrastructure investment. The airport construction started in 2014 before China's economy began to slow. But it fits into the priorities of President Xi Jinping, whose government continues to spend heavily on infrastructure and transportation as key drivers of development. The country invested $120 billion and $12 billion in railways and civil aviation, respectively, in 2018, according to transportation authorities. The capital's main airport now, Beijing Capital International Airport northeast of the city, has been straining at maximum capacity for years and plagued by delays, said Yi Wei, deputy manager of the Daxing airport's planning department. "It's heavily overloaded," Yi said. "We estimate, basically, that about 400 flights every day are held up because of air traffic control approval." The number of Chinese fliers has been rising faster than airports can keep up. Annual passenger traffic reached 1.264 billion in 2018, up 10.2 percent from the previous year, says the Civil Aviation Administration of China. China will overtake the United States as the world's largest aviation market by 2022, two years sooner than previously predicted, according to the International Air Transport Association. Industry analysts say that while a new airport is badly needed, it still may not solve the long-standing problem of delays. China has some of the strictest controls on flying during bad weather, often leading to mass groundings during thunderstorms. It also has one of the tightest controls on civilian airspace. Only a quarter of the country's airspace is open to civilian jets, while the rest is reserved for the military. That ratio is reversed in the United States. The new airport in Beijing's far south is also part of a major project by the Chinese government to develop the plain that includes the cities of Beijing and Tianjin as well as the smog-blanketed Hebei province, which has mostly relied on agriculture and industries like steel for economic growth. Daxing airport will be at the center of the new economic zone and will be accessible by rail to Xiong'an, a Hebei province farming town where China will relocate many "noncore" central government offices, essentially creating a secondary Chinese capital from scratch. Cao Yunchun, a professor from the Institute of Airport Economics, Civil Aviation University of China in Tianjin, said the new airport will stimulate the development of the relatively poor south of Beijing and nearby Hebei province. "In the future, the area will be a hub for the flow of people, the flow of travels, the flow of physical goods, the flow of capital, and the flow of technology," he said. The new airport has also promised to serve passengers from 28 cities, who would be able to reach the airport within three hours through high-speed rail. It has four runways and a 3.37 million square foot terminal building and plans to accommodate 72 million passengers and 2 million tons of cargo annually by 2025, with a long-term annual target of handling over 100 million passengers, 4 million tons of goods, and operating six runways. Daxing's long-term expected passenger flow would put it among the world's busiest airports. By comparison, Atlanta's airport handled 107 million passengers in 2018 - the most in the world - followed by Beijing's existing Capital airport at 101 million and Dubai International Airport at 89 million, according to Airports Council International. Daxing airport officials say the project has boosted the domestic industry and economy. "The general contracting is done by ourselves. We didn't corporate with international companies," said project manager Li Jianhua. "Most of the equipment is domestically made. Most of the materials are domestically made." Nicknamed "the Starfish" by Chinese media, the new airport will have five concourses spiraling out of the primary hall. Five traditional Chinese gardens will be built at the edge of each line where passengers can wait for their flights. According to Li, as the Chinese idiom goes, prosperity is brought by the dragon and the phoenix. The new airport is phoenix-shaped, in contrast with the existing dragon-inspired Beijing Capital International Airport.